Part live stunt, part social media activation, we helped one of America’s largest craft brewers pull off their biggest beer launch in years. Deschutes Brewing asked Digital Kitchen to help launch Fresh Haze, their new hazy craft IPA. 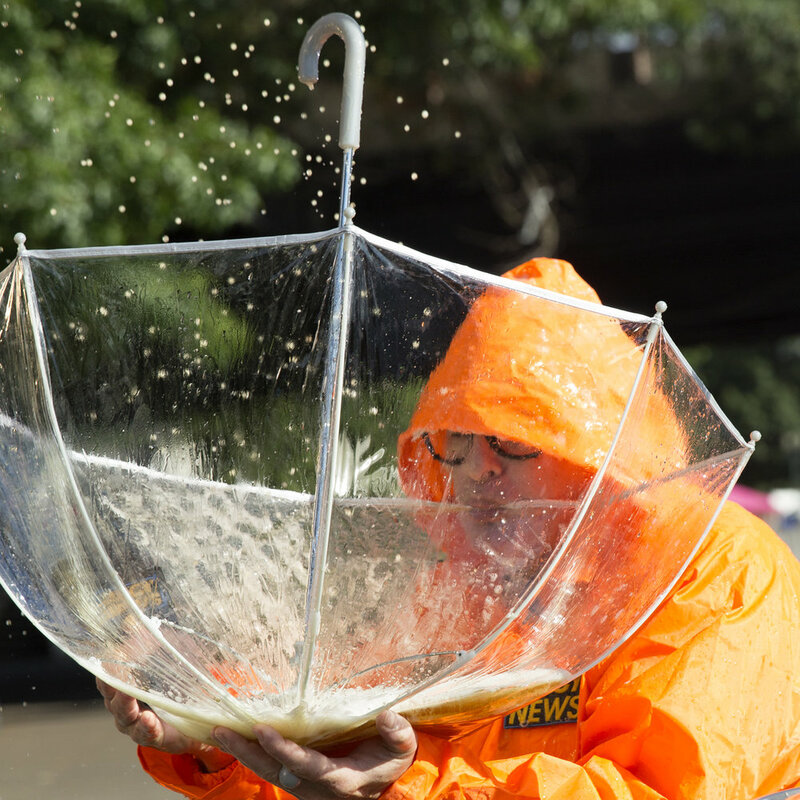 Not only did we build a machine that made it rain beer, we also teamed up with an improv weatherman who didn’t mind getting a little bit soaked as he reported on the juicy downpour sweeping the nation across social media. As Deschutes prepared to launch Fresh Haze IPA, we launched a teaser campaign on Deschutes social channels. Short weather teasers by an over-the-top weatherman were localized to specific regions. “Look out, Portland! Something hazy is coming your way” exclaimed our weatherman. A green screen map and news ticker allowed us to further localize the weekend’s hazy forecast on a hyperlocal level. The juicy downpour hit Portland. Over a marathon day, we reported from 5 locations around Portland, Oregon on Facebook and Instagram. From PDX’s famous Burnside skate park to the iconic Morrison bridge, our weatherman provided Deschutes fans with live updates on the hazy stuff soaking the Rose City—including interviews with beer lovers, festival goers and a few of our friends at the Deschutes Pub. To sustain the conversation, DK helped Deschutes launch a series of short paid pre-roll trailers on YouTube and Facebook. 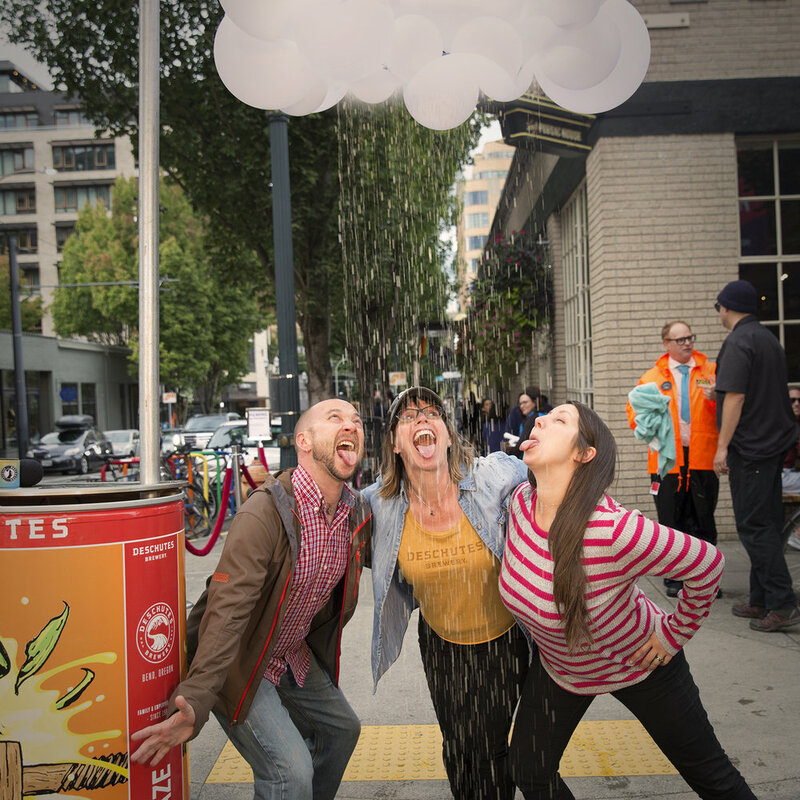 The party continued into the wee hours as DK installed an electric cloud sculpture in the Deschutes Public House. Each time someone ordered Fresh Haze IPA, a switch tripped off a thunderous downpour. Deschutes asked DK to get their new Fresh Haze IPA into the right hands. So we answered by sending social influencers a holiday surprise: a gift box with two festive sweaters—one for them, and one for their new, pint-sized buddy. We included a personal holiday greeting signed by the Deschutes team, asking to light up the holiday hashtags with their matching sweater pics.